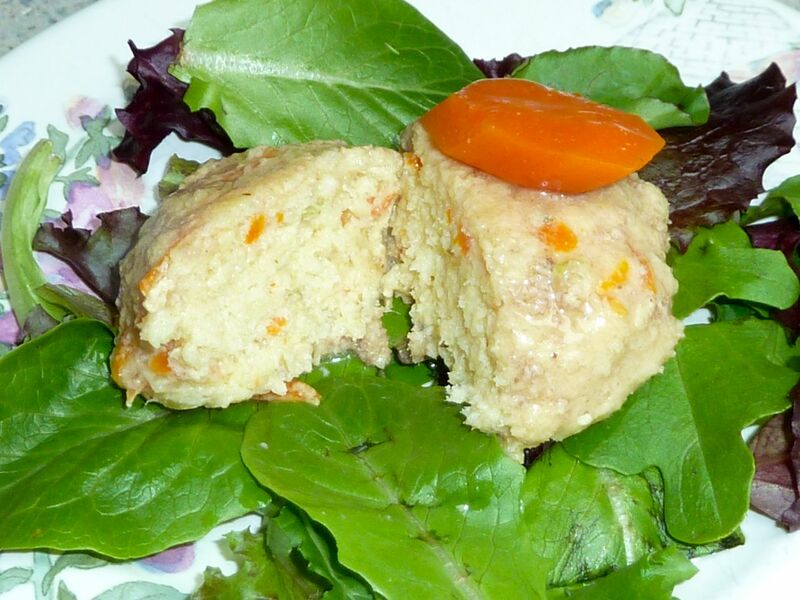 Gefilte Fish is a fish cake appetizer. 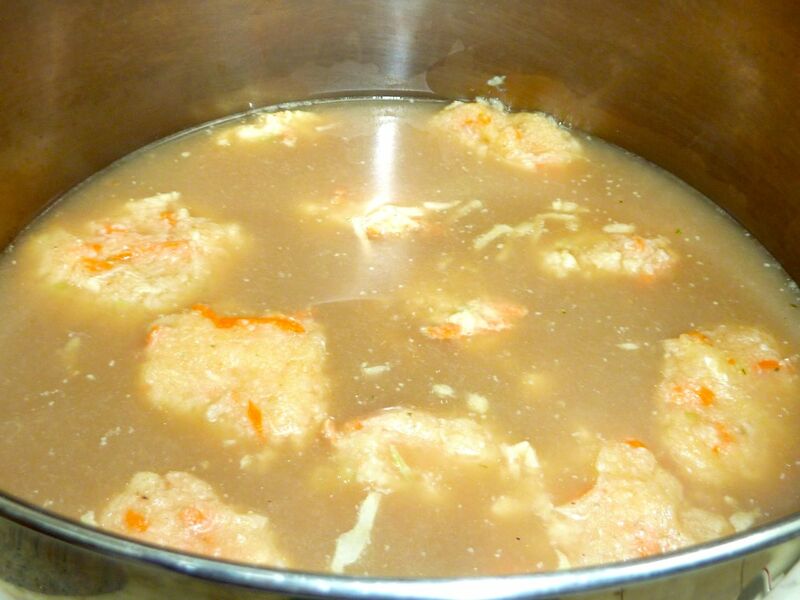 Traditionally eaten on Holidays such as Passover, on the Sabbath and anytime. 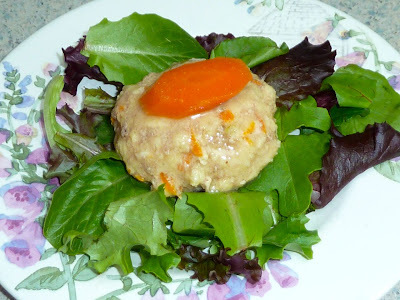 This is the first time I made Gefilte Fish, usually I buy it from a store. It is not gluten free though so I don't have any, I just serve it to other guests. This year I was not able to get to the place where they make the best Gefilte Fish, Kosher Island in Staten Island, New York, so I decided to try to make a GF version. 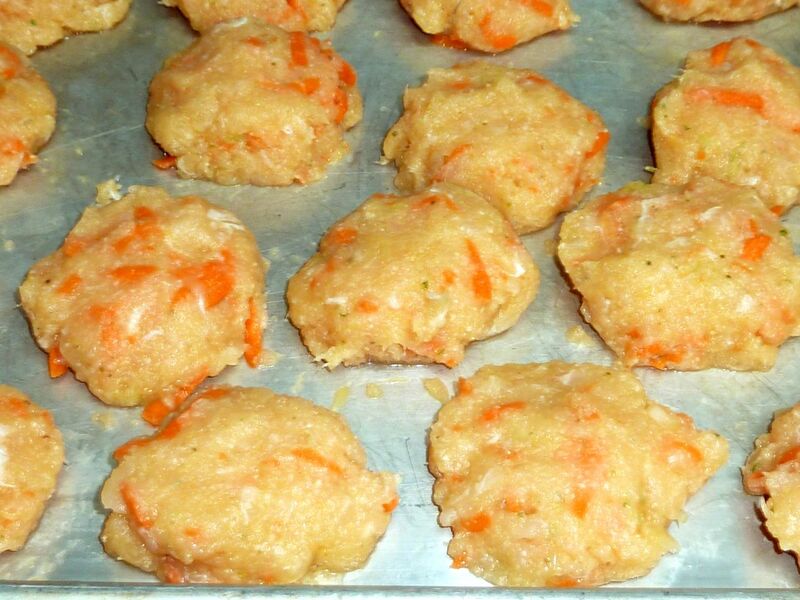 The fresh made gefilte fish cakes were really delicious. It is much easier than I thought it would be, especially with a food processor. Usually the fish is ground in a meat grinder. Fishmongers will do this for you if you live in the right neighborhood. I do not. In fact, I could not even find the typical type of fish that is used in the recipe, so I just bought the type of white flesh fish that was available. I read on-line that some people even use salmon (my favorite fish). I guess I wanted to stay with white fleshed fish in order to make it most similar to what I think of as gefilte fish. For gluten free I replaced the matzo meal in the recipe with raw Cream of Rice cereal. This produces a very similar texture to what I remember matzo meal having in foods such as Matzo Balls. If you can not eat rice just use potato starch or tapioca flour instead. Store made recipes use more filler than this recipe and next time I may add more cereal than called for to resemble the store made texture better. Also, I was afraid to grind the fish too much in the food processor and left some larger pieces. These tasted fine, but the texture was more fish cake-like than gefilte fish cake-like, so I may grind it more finely next time. Just saying, don't be afraid to grind it too much. I was also a bit worried that the cakes would not stay together when boiling, but, to my delight, they stayed intact and did not adhere to each other. My guests and I all enjoyed the home made gefilte fish and I will definitely make it again, instead of buying it. I am especially motivated to make it myself, because I can actually eat it now with the GF ingredients. First make the fish broth. Remove the dirty outermost brown layer of onions, but use the brown part in the broth. Add extra brown skins from the onions for the fish cakes. Cut up the onions, celery and carrots. Place the onions, celery, carrots, fish heads and bones and skin, salt, pepper sugar and water in a large stock pot and bring to a boil. Lower the heat and simmer for about an hour, uncovered. Remove any scum that rises to the top and discard. When done pour the stock through a sieve. Reserve the liquid and discard the fish and vegetables. Clean the stock pot and pour the reserved fish broth back in. Return the broth to a simmer. While the broth is simmering, make the fish cakes. Cut the fish into large chunks and place in the food processor. Grind the fish coarsely in the food processor and then transfer the ground fish to a large bowl. If you were able to have the fishmonger grind your fish meat for you, skip this step and place the ground fish in a large bowl. Coarsely grate the peeled carrots, celery and peeled onion. Add salt, pepper and sugar to the ground fish and mix in well. Make a well in the center and add the eggs, Raw Cream of Rice cereal, tapioca flour and grated vegetables. Mix well. Wet your hands and form the ground fish mixture into oval shaped cakes and place on a platter or baking tray until ready to cook. The mixture should make 20-22 cakes. Raw GF Gefilte Fish Cakes on baking tray. When the strained broth is simmering again, place the fish cakes, one-at-a-time into the pot. Also add the two whole peeled carrots to the broth. The whole carrots will later be sliced and used as a garnish on top of the fish cakes when serving. To prevent the cakes from sticking to each other shake the pot from side to side after all the cakes have been put in the broth. Cover the pot and cook for 1 ½ hours on low heat. Occasionally check that the tops are not drying out and pour broth over the tops or gently turn the cakes over if necessary. GF Gefilte Fish just after all the cakes were put into the pot of broth. When done, gently remove the cakes with a slotted spoon, one-at-a-time, from the pot and place on a platter or baking tray to cool. Completely cooked GF Gefilte Fish. Place the cooled fish and broth in the refrigerator to cool completely for several hours or overnight. Traditionally gefilte fish is served cold. I had a warm 'tasting' portion and it was really good warm too. To serve, place the fish on a platter. Slice the cooked carrots and place a slice of carrot on each piece of fish. Garnish with some chopped parsley and pour some jellied broth over the fish. White and red (with beets) ground horseradish is the usual accompaniment. 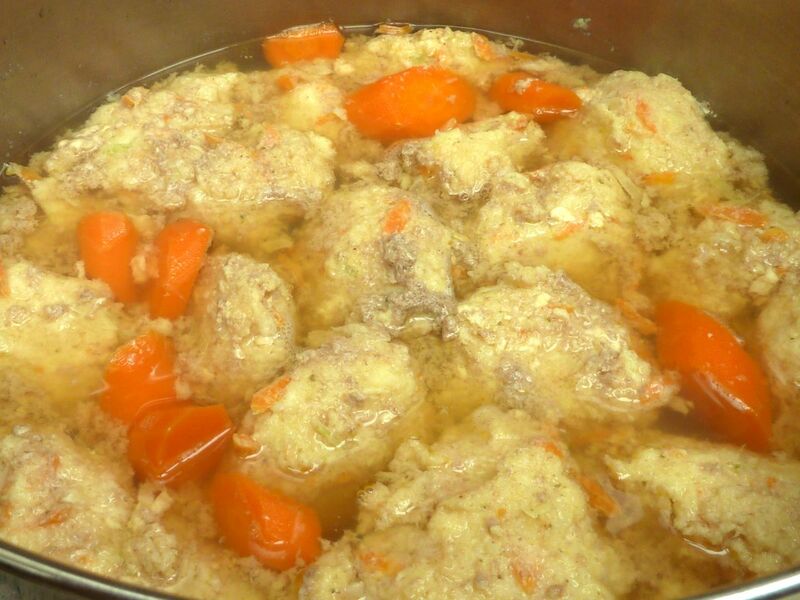 GLUTEN FREE GEFILTE FISH Ingredients FISH BROTH 1 lb. Fish bones and head, with some skin. (These are from the White Fish and Yellow Pike.) 5 cups Water 2 medium Onions, including the brown skins 2 large Carrots 1 stalk Celery 2 tsp. Sea Salt 1 tsp. Black Pepper 1 tsp. Sugar FISH CAKES 1 lb. White Fish (meat and bones) (½ lb. meat only) 1 lb. Yellow Pike (meat and bones) (½ lb. meat only) ½ lb Carp (meat only) ½ lb. Cod (meat only) (If you can not find these fish use a total combination of 2lbs of fish meat from any white fleshed fish.) 5 0z. Carrots 1 large Onion 1 stalk Celery 2 tsp. Sea Salt 1 Tbs. Sugar ½ tsp. Black Pepper 2 large Eggs 2 ½ Tbs. Raw Cream of Rice Cereal (I may use ¼ cup next time.) 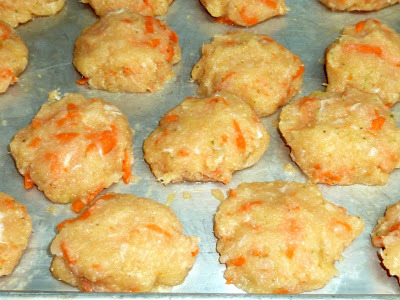 ¼ cup Tapioca Flour GARNISH 2 Carrots 3 Tbs. Chopped Fresh Parsley DIRECTIONS First make the fish broth. Remove the dirty outermost brown layer of onions, but use the brown part in the broth. Add extra brown skins from the onions for the fish cakes. Cut up the onions, celery and carrots. Place the onions, celery, carrots, fish heads and bones and skin, salt, pepper sugar and water in a large stock pot and bring to a boil. Lower the heat and simmer for about an hour, uncovered. Remove any scum that rises to the top and discard. When done pour the stock through a sieve. Reserve the liquid and discard the fish and vegetables. Clean the stock pot and pour the reserved fish broth back in. Return the broth to a simmer. While the broth is simmering, make the fish cakes. Cut the fish into large chunks and place in the food processor. Grind the fish coarsely in the food processor and then transfer the ground fish to a large bowl. If you were able to have the fishmonger grind your fish meat for you, skip this step and place the ground fish in a large bowl. Coarsely grate the peeled carrots, celery and peeled onion. Add salt, pepper and sugar to the ground fish and mix in well. Make a well in the center and add the eggs, Raw Cream of Rice cereal, tapioca flour and grated vegetables. Mix well. Wet your hands and form the ground fish mixture into oval shaped cakes and place on a platter or baking tray until ready to cook. The mixture should make 20-22 cakes. When the strained broth is simmering again, place the fish cakes, one-at-a-time into the pot. Also add the two whole peeled carrots to the broth. The whole carrots will later be sliced and used as a garnish on top of the fish cakes when serving. To prevent the cakes from sticking to each other shake the pot from side to side after all the cakes have been put in the broth. Cover the pot and cook for 1 ½ hours on low heat. Occasionally check that the tops are not drying out and pour broth over the tops or gently turn the cakes over if necessary. When done, gently remove the cakes with a slotted spoon, one-at-a-time, from the pot and place on a platter or baking tray to cool. If you like, strain the broth again, discarding the solid pieces and reserving the broth. Then cook the remaining broth down until 2 cups of broth remain. The remaining broth, when cooled, will have a jelly-like consistency. I did not strain and reduce the stock again, because I like the pieces of fish that remain in the broth. The strained mixture looks prettier when served with the fish Place the cooled fish and broth in the refrigerator to cool completely for several hours or overnight. Traditionally gefilte fish is served cold. I had a warm 'tasting' portion and it was really good warm too. To serve, place the fish on a platter. Slice the cooked carrots and place a slice of carrot on each piece of fish. Garnish with some chopped parsley and pour some jellied broth over the fish. White and red (with beets) ground horseradish is the usual accompaniment.